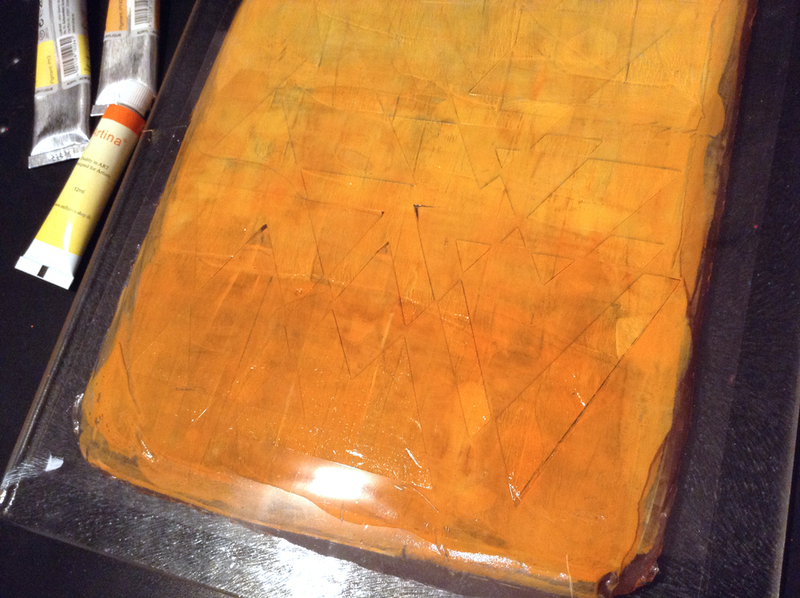 …is not to remove the cover from your brand new big size gelli plate before using it. And it just happened to me. Having my head in the clouds, thinking of many too many other things having on my “plate” right now. After 4 prints I was wondering what was wrong with my acrylic colors today – too cold, too old, dried out… and then I saw it!!! 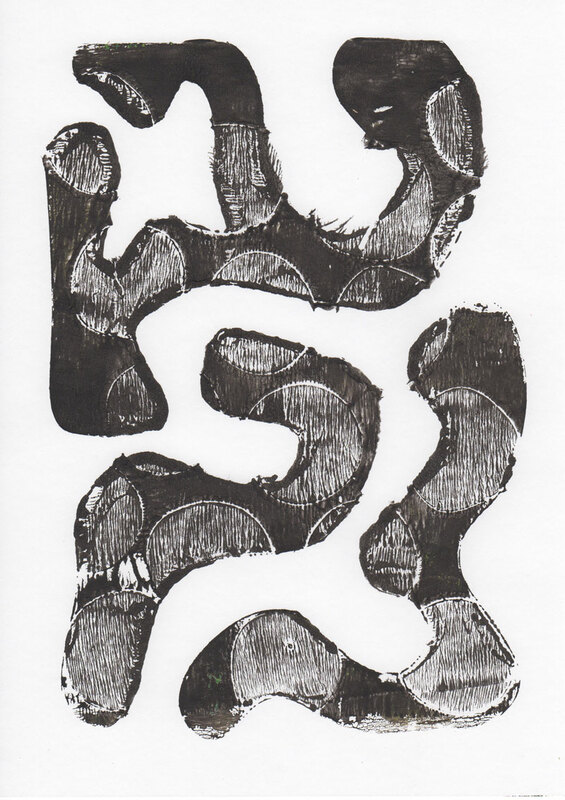 But let’s just call it artistic freedom and enjoy those much too dry, but interesting looking prints. Another good thing is, it will never happen again, because the cover sheet now was much too beautiful with my self scanned and cut multi layered stencils, so that I did not clean it. It goes into the package after using just like this. Maybe it’s just me, but I find it smells a tiny little bit like spring already. At least I felt for doodling flowers yesterday on my Wacom into my Mac and then again out of the Mac on paper with my Cameo cutting machine. I could have done this directly with pen on paper. Ok, but having them as a file I can have them drawn over and over again on different paper with different colors and versions. 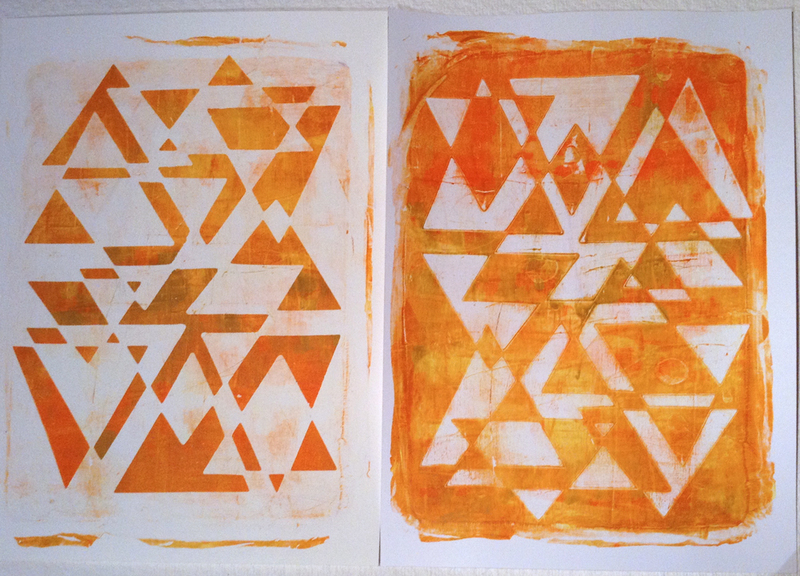 I cut a matching stencil for easy application of more color. This is quickly done with Rangers Mini Ink Blending Tool and Distressed Ink pads. 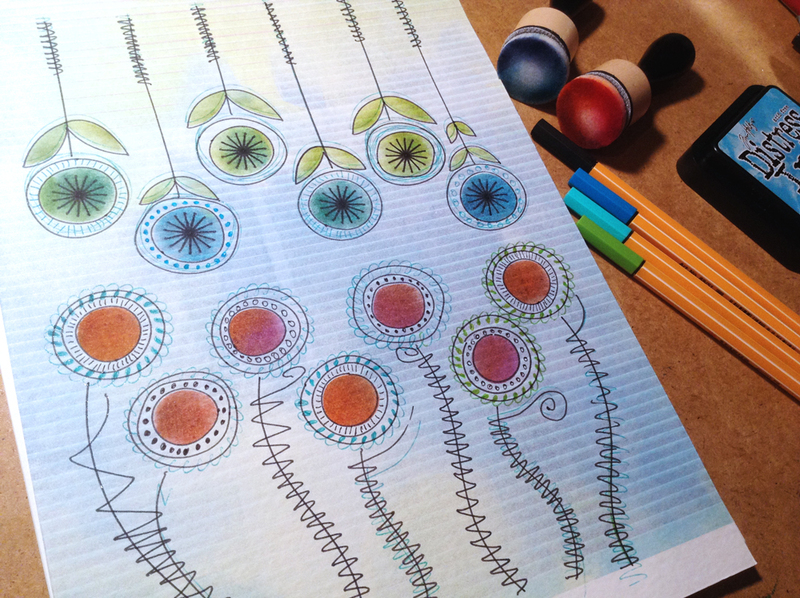 Then I did a test run on a striped misprint, added some hand drawing on the flowers and wow… now I like the page so much, that I don’t want to cut it in pieces for tags or cards anymore. 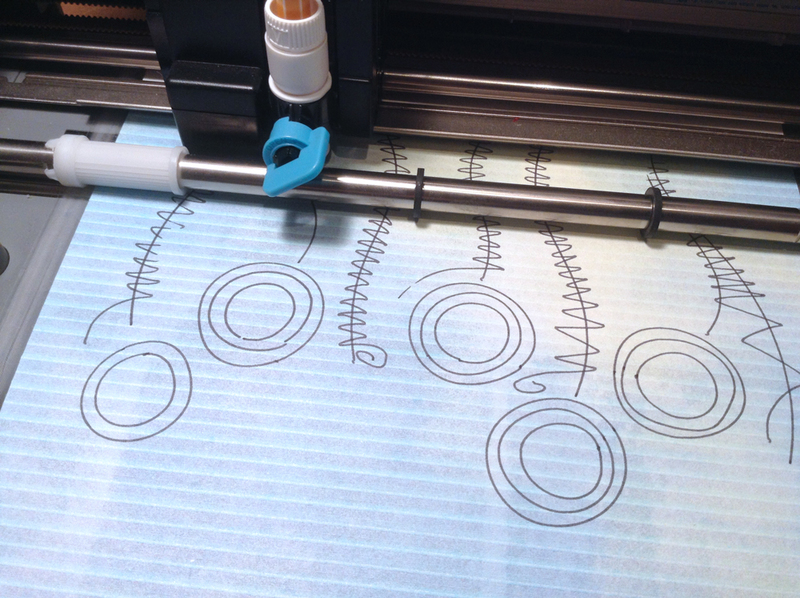 But how handy, I just can make more of them and the machine already started her well known singing sounds while moving the pen …. 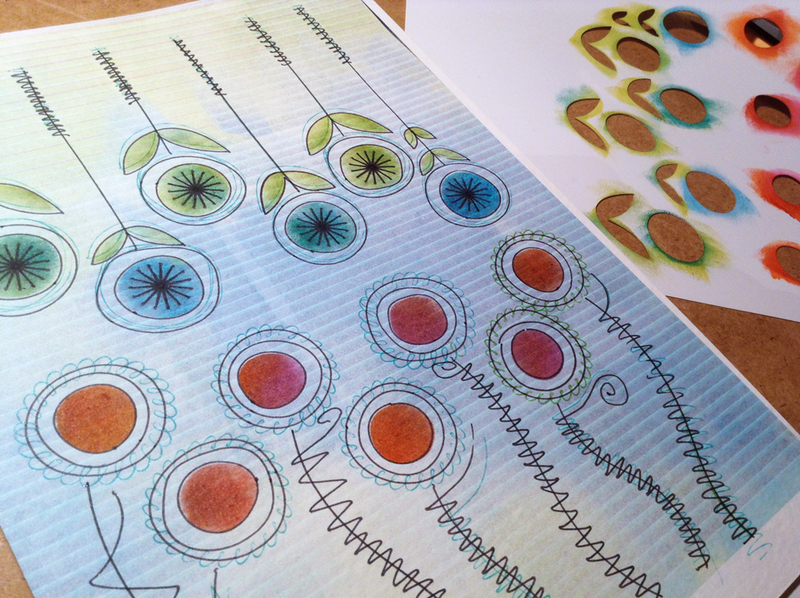 After so much precise vector work the past weeks I did some relaxation with my gelli plate last night. 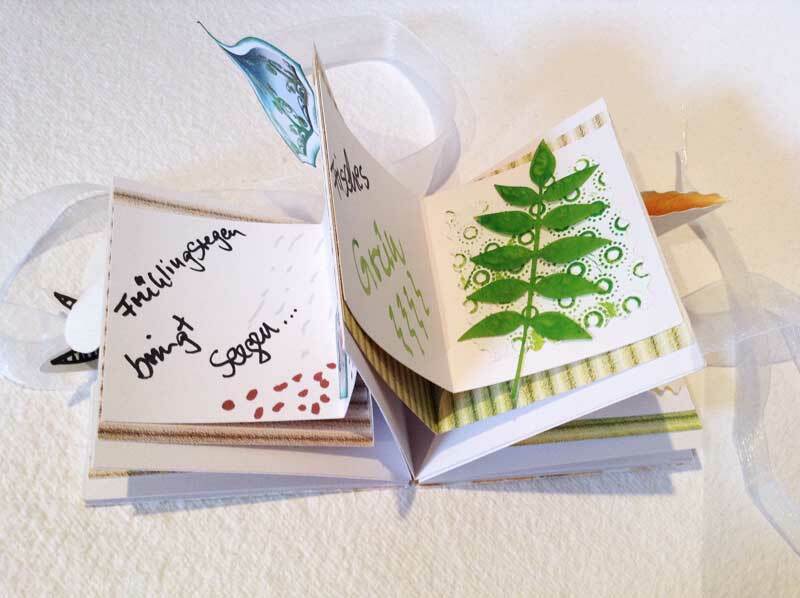 First I prepared some embossed papers and die cuts I wanted to use. 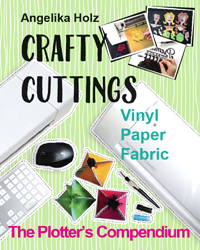 Of course I could not control myself again when Sizzix UK had their big sale lately, so I got a big box with new embossing folders and decorative strips dies. 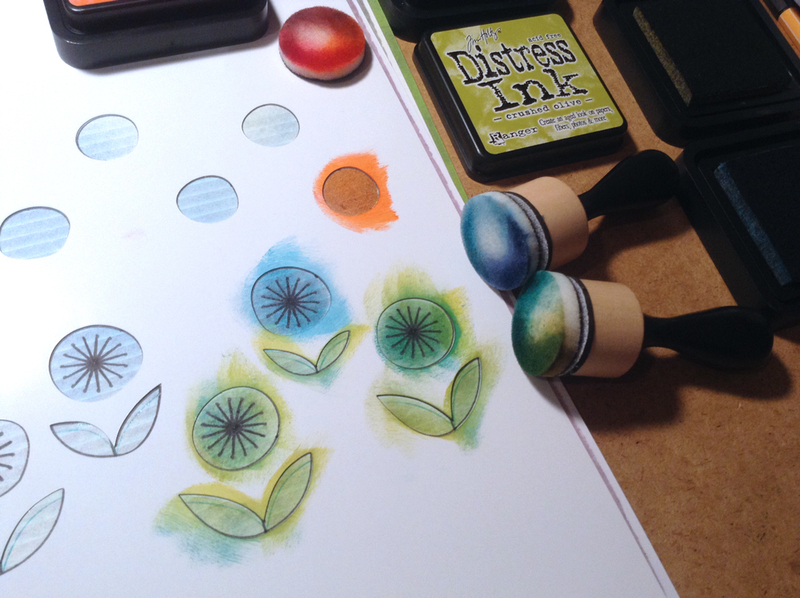 I was instantly in love with the Tim Holtz dies. On the top print I used them as stencils, but they kept sticking on the print after removing the page from the gelli plate giving a lovely effect just like the flower masks from film, which are covered with acrylic paint and sticking between the stencils and the page. So this has become a mixed media page without intention. I tried adding golden modeling paste, which looks much more beautiful on the original print than on the scans. The black and white is just decorative and maybe I will go on working on it. 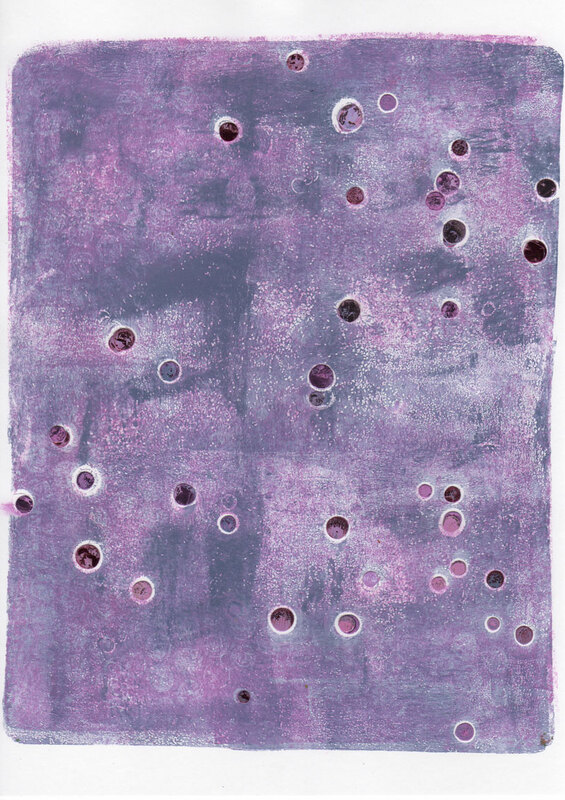 For the purple print I used some dots from the trash from mirror cardboard and wow, they also been sticking and still shiny after removing, so I just let them stay and shimmer. 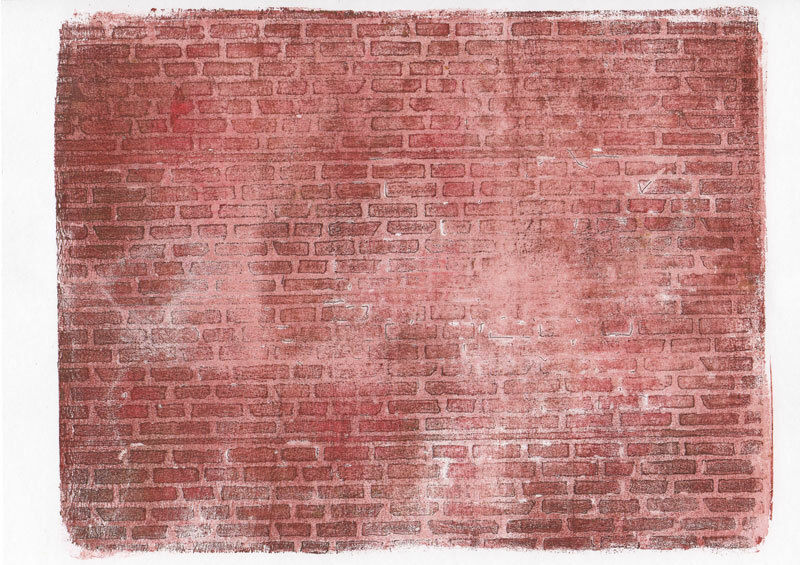 And the bottom print will be a wonderful background paper whenever I need a walltexture. I never expected it to come out so cool. 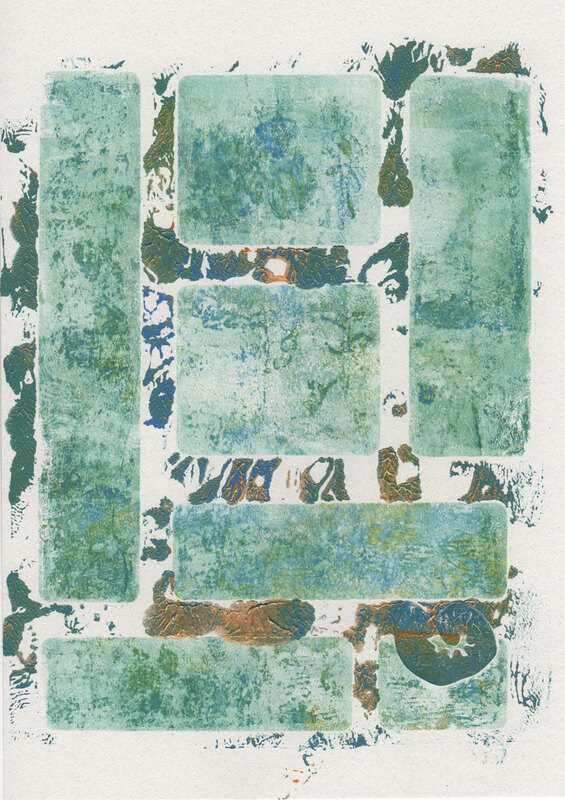 The first print did not look very spectacular, but this is the second print with removed stencils. What a surprise. 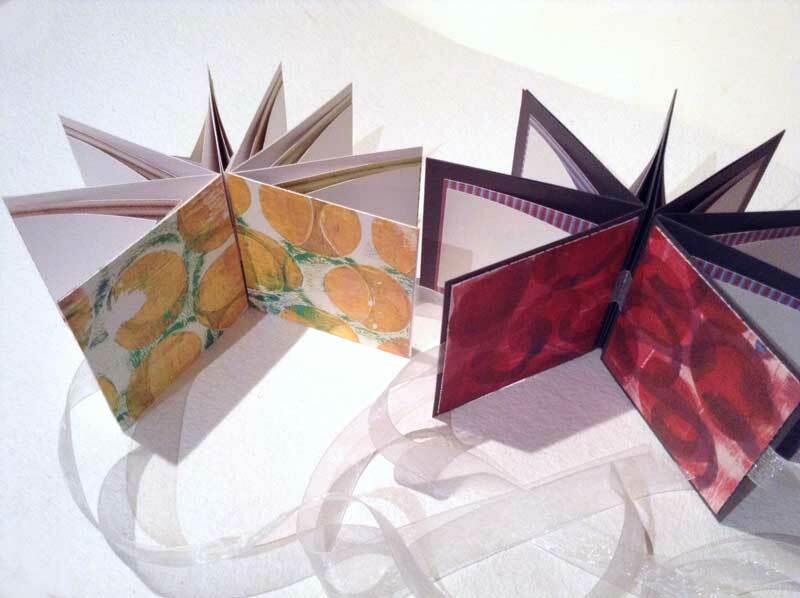 Altogether a successful gelli session and so much fun! Last week I made a whole bunch of own stencils from overhead film. 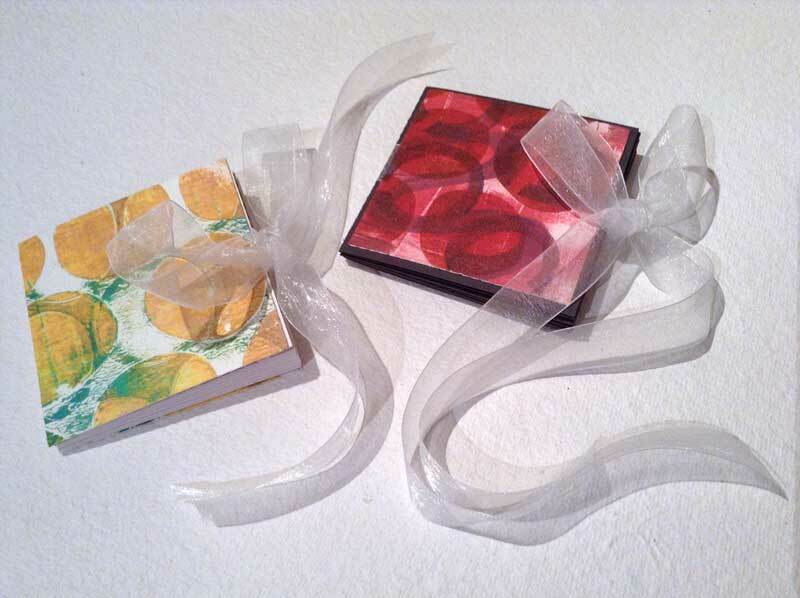 I find them perfect for use with the gelli arts plate. 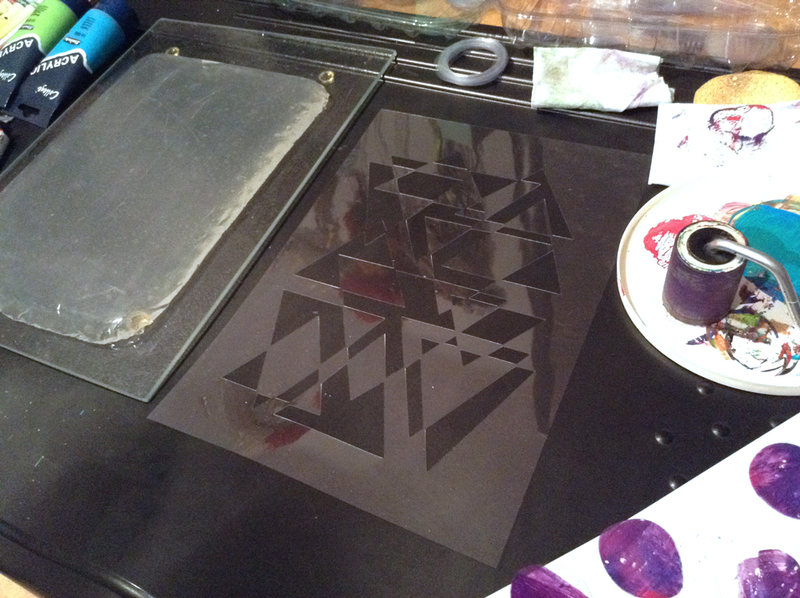 The prints from the stencils are giving a different structure than from the gel plate. 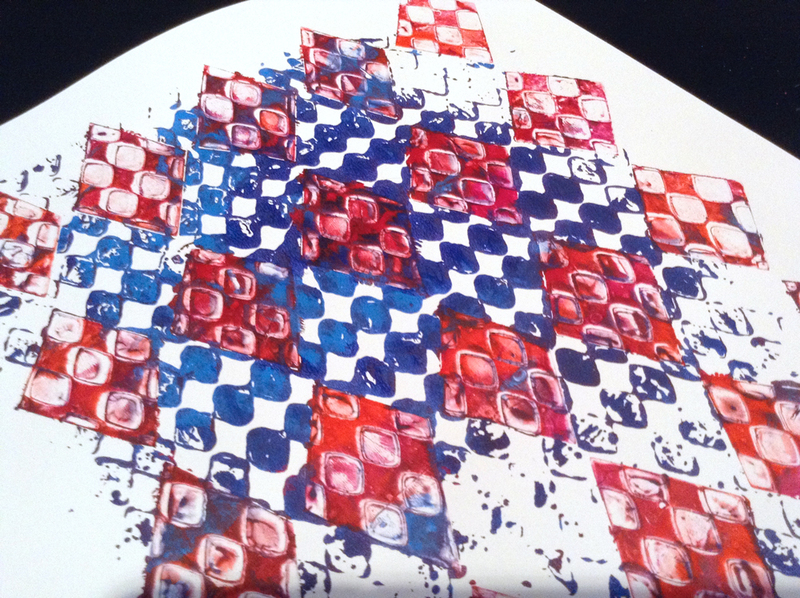 This way you get beautiful effects and you can make more prints from one session. I used some embossed card stock for texturing and got a beautiful scrap for further use. 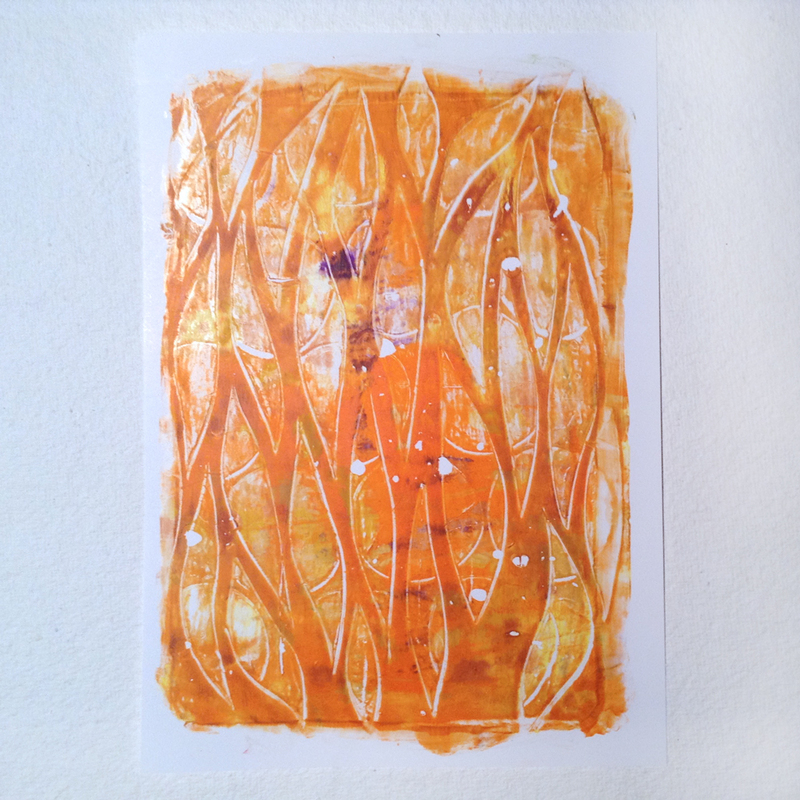 One of my most favorite “paint” for gel printing is acrylic medium. I use glossy and matte and I love both of them. 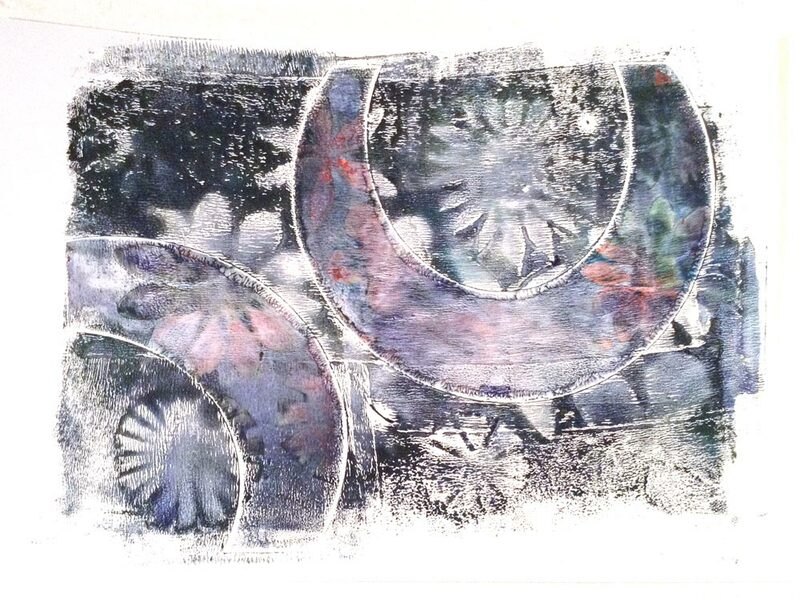 It is perfect to make a pastel last print from left over paint on the plate. 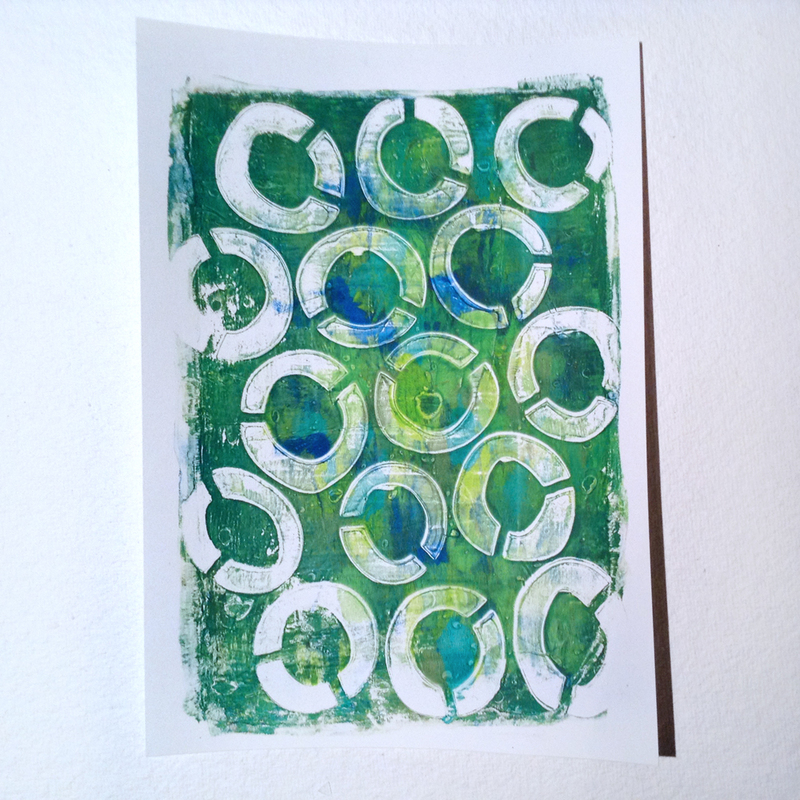 You can liquidify with just putting 3-4 drops of medium onto the plate, then using the brayer to spread it over the plate. This is one big advantage of the natural gelatine plate. 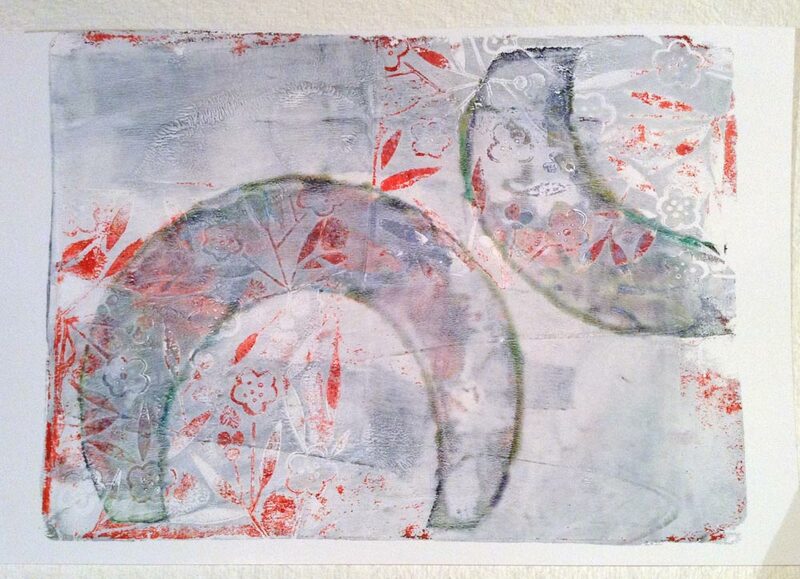 It is wet, the Gelli Arts plate is dry. 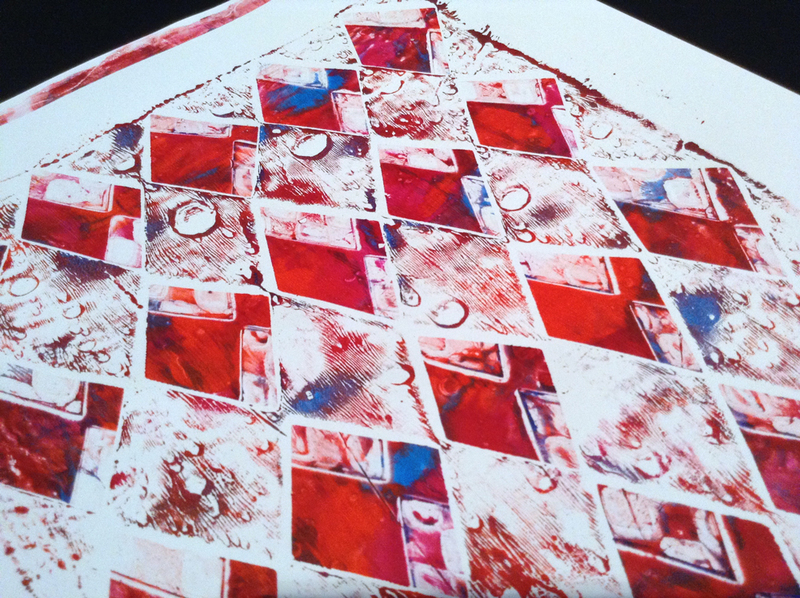 But with acrylic medium even the last traces are going off and make wonderful last prints. Last week I needed a special “get well” card for an ill friend. I thought it must be more than just a card and it has to be spring themed. I still had some unused cutting files from the Silhouette online store in my library and I had a brand new Epson A3 photo printer (my early birthday gift, such a cool machine…) here, not yet tested. So I started with a 3D star booklet and cut the parts on my Silhouette Cameo in heavy white paper and grey card stock. Then I printed some big sheets with fresh stripes and recut the middle parts. For cover and backside I used test prints from one of my gelli prints. 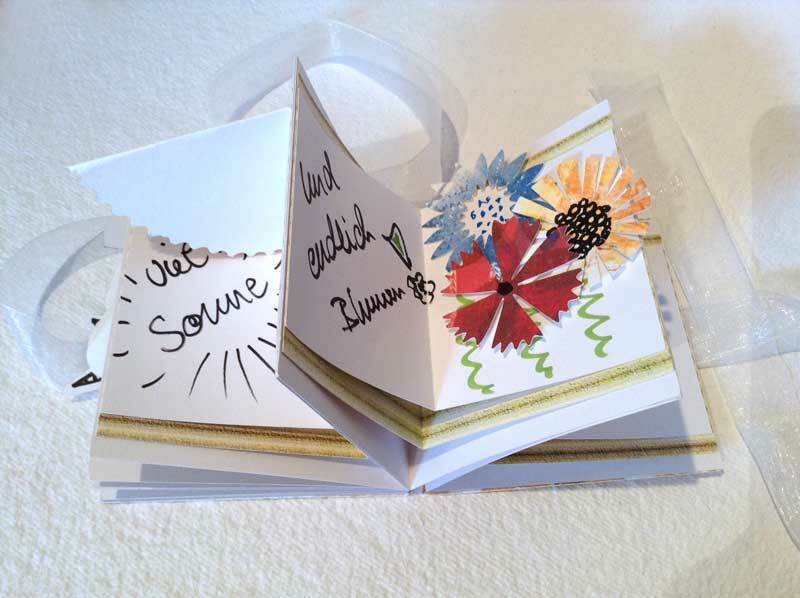 Then I filled one of the finished booklets with embellishments, scraps and some hand written text. The other I kept blanc for later use. 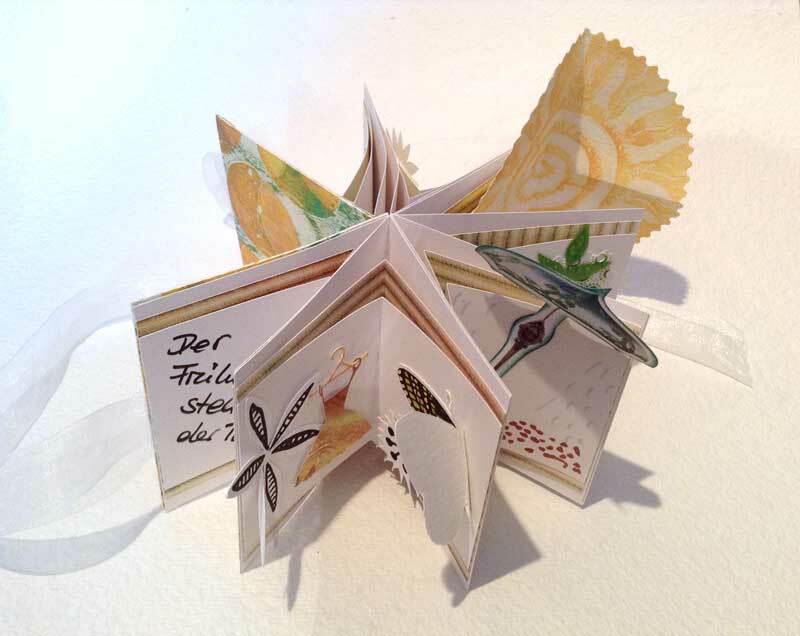 Now my spring booklet is almost a pop up album and the gift was a big success. So today I used my new stencils with the new made gelatin plate. 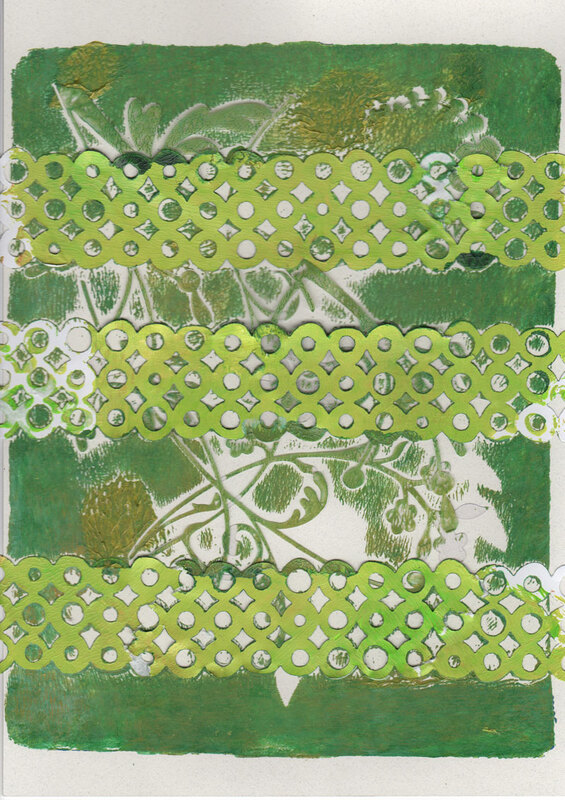 I think I am going to order the Gelli Arts plate next week. I saw it is available again. My gelatin plate is full of color pigments now after 2 times usage. For my next session I definitely need a new one. I got another stack of prints. There are not many I am really happy with today though. While printing I wished I had a redo button like on the computer, because I ruined a beautiful print with adding another layer and it has just not been a good choice, what a pity. I wished I had more control and I could repeat a print, but no way. Here you can see some work in process pics and some results. More pics I’ll show tomorrow….